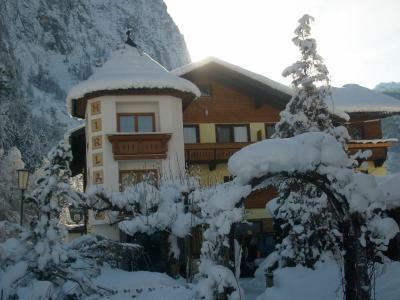 Lock in a great price for Gasthof Pension Hirlatz – rated 8.8 by recent guests! The location is walking distance to town, 10-15 min walk. The staff are very friendly and do their best to please. The room was spacious, comfortable and clean with a nice view from the balcony (room 4). Good quality finishing and since it’s managed by a family, you feel very at home. Breakfast was ok, fitting a 3 star rating. The rooms are clean and beds are comfortable. They always filled water everyday for us. The breakfast is simple but tasty. The staffs were very very friendly and helpful. Hotel location is away from the busy tourist area of Hallstatt.. We left our car parked at the hotel our entire stay. Easy walk to the funicular for the salt mine, and into the downtown area. There are also two hiking trails just beyond the hotel -- the first can be picked up across from the parking lot. It takes you on an easy walk through the woods. The second is just beyond the recycling plant -- it takes you to the waterfall. Both are very nice hikes. Breakfast buffet was very good. The onsite restaurant was closed both evenings. Small bar was open so we were able to get beers to take to our room. Staff was very friendly and hotel was clean. Location and the view and super friendly and helpful staff. I liked the fact that wasn’t right in the city center as you had your peace and we were away from tourists. Breakfast was really nice! During the dinner they made us mulled wine on request which was nice too. Breakfast was pretty good and they offered fresh fried eggs. Friendly staff. Quiet area. The breakfast egg on your wish. Parking available. Close to mountains and the lake, too. Ideal for morning jogging. We enjoyed the patio and the 2 areas in the room, sitting and sleeping. The woman working was super helpful and always so nice. She seemed to do it all. This place is a very long walk from the ferry boat, but we loved the location once we settled in. It is away from all the tourists. We caught a cab for 10 Euro on the way back to the ferry. The food we had there was excellent. I loved how quiet and peaceful this place was. It has a beautiful and relaxing walk to and from the town center and really gave me time to soak up the natural beauty of the area. The food was delicious and service was professional as expected. The room was clean and comfortable. I will definitely be staying here again. 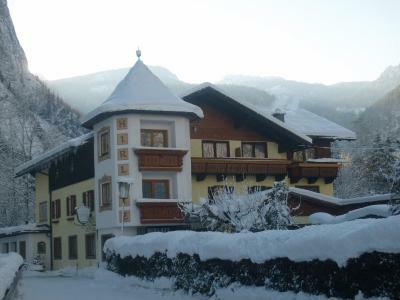 Gasthof Pension Hirlatz This rating is a reflection of how the property compares to the industry standard when it comes to price, facilities and services available. It's based on a self-evaluation by the property. Use this rating to help choose your stay! Located in the World Heritage town of Hallstatt, Pension Hirlatz is just a 20-minute walk from the center and Lake Hallstatt. Hiking and mountain bike trails start right outside. 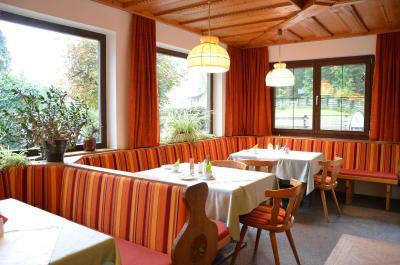 The traditionally furnished rooms at Pension Hirlatz feature cable TV, a work desk, and a bathroom with hairdryer. The property features a Finnish log cabin sauna, an infrared cabin, and an outdoor pool as well as a Kneipp pool in summer. Free private parking is provided at Gasthof Pension Hirlatz. The Dachstein West ski area is 9.3 mi away, and the Krippenstein ski area is 3.1 mi away. Both can be reached with a free ski bus. The Salzberg cable car is just a 5-minute walk away. 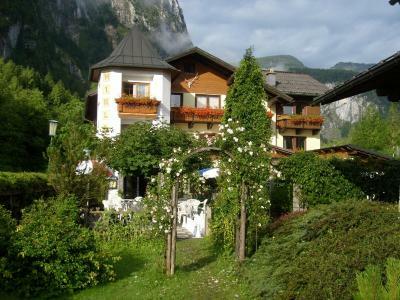 뀐 Located in the top-rated area in Hallstatt, this property has an excellent location score of 8.3! When would you like to stay at Gasthof Pension Hirlatz? House Rules Gasthof Pension Hirlatz takes special requests – add in the next step! Gasthof Pension Hirlatz accepts these cards and reserves the right to temporarily hold an amount prior to arrival. If you expect to arrive outside reception opening hours (after 18:00), please inform Gasthof Pension Hirlatz in advance. Please note that private parking is available in the courtyard. Parking on the street is only possible for check-in. Please inform the property about the number and age of children in your booking. We​ had.a hard.time finding the.location.​ Its​ like.30.minutes walk.from boat station. Its.clean, quiet and.cozy.​Staff.are​ friendly.​Its​ close to.skywalk and.supermarket.​Love​ their coffee. May be the owner need to specify in the description that the nearest station to the guesthouse is Hallstatt Lahn bus station. Its 20-25 minutes from Hallstatt market ferry station. And during my stay for 4 nights the construction behind the hotel is really annoying. They start to work at 6.30am every day. Its really disturbed our sleep. The cleanliness is very good and the room condition is exactly as in the photo. The view from the room also very nice close to the moutain. The breakfast they provided also a lot of choices and they have coffee, tea and fruit juice every days. An incredible disappointment. Awful really. We should have demanded a refund or at minimum a discount. I contacted this property ahead of time explaining our situation and requesting a room with a view, but primarily a quiet room since my wife was recovering from surgery. They knew this and they knew of the ridiculous noise adjacent. They should never have assigned a room there or refunded. They should be made to inform potential guests of the work being done!!! And even without the detestable noise, a view of a parking lot, garage and machinery?? We got no sleep for two nights with workers yelling, trucks beeping as they reversed and bulldozers shovelling stone. The woman at reception claimed to not know...impossible and not recent. They knew. We should have demanded at least one night back. This was our most expensive accommodation in our entire month long European trip and was the worst by far. Only redeeming aspect was there was a sauna. It is at the innerside of the town and a little bit remote. One of the best breakfasts in Europe. Family pension. The bed linen would have been better if made of cotton not synthetic fiber. Nice room, with terrace and a great view. A plus bonus, the baby crib that we had so for sure is a nice place for families. I definitely recommend this place. The room was very large, and had great views. The hosts were very nice and helpful. We couldn't make it to breakfast as we were leaving for a tour early in the morning, so they prepared sandwiches for us the evening before. Very nice service! The entrance to the gasthof was small, tired looking, and had a terrible smell of fried food in the evening. The airing system in the rooms were very poor as the friends who stayed in rooms 10 and 18 (esp 18) complained heavily that they felt the smell all night long, had to open windows and disturbed their sleep. In our room (room 12) we were more lucky and did not feel it in the room so much. However, next morning the terrible fried food smell dominated the entrance/lobby area again. For the room price we paid (136 Euro per room) this was a very unpleasant experience. There is no elevator as well so you have to carry any luggage yourself. Location is as stated, bit far off the center but walking distance. We chose this place due to its high rating in booking com but were dissapointed, it seems to be too high rated for what it offers. Rooms were relatively spacious, silent, reasonably comfortable (only issue was the water pressure in shower was a bit weak). Breakfast was fine. 15 mins walk one way from downtown Hallstatt. We don’t have any problem because we enjoy walking the scenary. Should you not want to walk too much, there is a shuttle that take you back and forth between hotel and downtown for small fee. The place was wonderful. We had a view of the mountains from the room it was amazing to wake up to. The breakfast had good options and the location was amazing. A bit further out of town for those who can't walk as much. About 15 mins but it wasn't an issue for us as we loved the scenery on the way. The rooms were great, balcony had a beautiful view overlooking the mountains. Room was really big and had everything you need. The hosts were super friendly every minute and always there to assist if needed. The breakfast is also amazing, so many choices. We really enjoyed our stay and have already said when coming back we'll only be going here :) thanks very much for our lovely stay. My partner also proposed to me during our stay so it'll always be in our memories. Hallstatt is just a magical place!